Recommended: Watch BBC Scotland anywhere using, ExpressVPN. Just when you thought there wouldn’t be anymore BBC terrestrial channels, the launch of BBC Scotland surprises us all. It’s about time that Scotland had a dedicated channel and while it’s still early days and time will tell how much dedicated Scottish content it will have it’s a move in the right direction. If you’re a Scot abroad and you’re interested in tuning into this channel, then your options are minimal. Although many UK streaming services are now available in the EU, BBC isn’t one of them. Plus with the uncertainty around Brexit, these channels could be revoked in the EU at any point. If you’re further afield, there’s no access to BBC or BBC Scotland at all. Below I’m showing you the quick and easy way you can watch BBC Scotland anywhere in the world. Where can I watch BBC Scotland? When can I watch BBC Scotland? To watch BBC Scotland abroad, you’ll need to do so on the BBC iPlayer online streaming service. Ordinarily, it’s blocked when you’re outside the UK. They limit access by using geo-restrictions allowing only those in the UK to watch it. By using a ‘VPN‘ app you can avoid these geo-restrictions allowing you to watch BBC Scotland outside the UK. VPN apps are entirely legal privacy apps that let you hide your online location and will cost a few pounds (or dollars) per month. 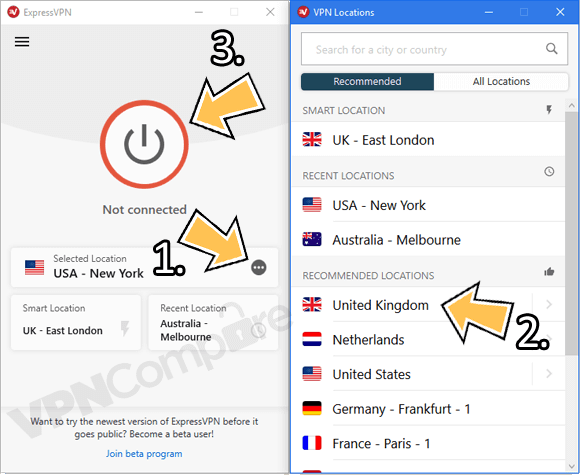 There are a lot of VPN services out there but my recommendation is ExpressVPN. It’s also worth checking out NordVPN and CyberGhost VPN if you want to compare the competition. You can subscribe anywhere from 1-month to 1-year or more and it’s a lot cheaper the longer you sign up for. Watching BBC Scotland on a computer or laptop is the easiest method. Just follow the steps below. 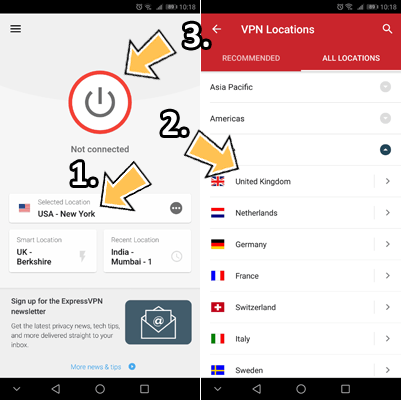 Visit ExpressVPN or one of the other VPN services and sign up. After you’ve completed sign up, navigate to the ‘Products‘ section of their website and download their Windows or Mac app. Open the app and login or activate it. You can find the activation code in the ‘My Account’ area of the ExpressVPN website. Then press ‘Choose Location‘ (1). In the new window press ‘United Kingdom‘ (2). Once the app has connected visit the BBC Scotland catch-up page or the BBC Scotland Live page. To watch BBC Scotland on a phone or tablet you’ll need to have the BBC iPlayer app already installed. See further below for details on how to get the app outside the UK if you don’t already have it. If you’ve already got BBC iPlayer installed then follow the steps below. Visit ExpressVPN and sign up for their service or one of the other services recommended earlier. Download the ExpressVPN app from your usual app store, either the Google Play Store or Apple App Store by searching ‘ExpressVPN’. Open the app and login with the account details you created at sign-up. Press the ‘…‘ (1) button next to “Selected Location”. The app will automatically start to connect for you. If it doesn’t, press the ‘Connect’ (3) button. Once its connected open the BBC iPlayer app and click the BBC Scotland channel. Watch BBC Scotland on your mobile device. If you’re outside the UK and you don’t have a UK registered device then you may find you’re blocked from downloading BBC iPlayer. For Android you’ll need to visit this URL : https://goo.gl/qCJYJH to download and install BBC iPlayer. If you’ve got an iPhone or iPad follow this guide on how to install apps outside their country. If you want to watch BBC Scotland outside the UK on an actual TV then the best way to do so is using an Amazon Fire TV device. This can be the Fire TV or Fire TV Stick. You can get one from Amazon if you don’t already have one. On a computer, tablet or phone visit ExpressVPN and sign up for their service. Now on your TV access the Amazon Fire TV / Stick. Use the ‘Search‘ option to search ‘ExpressVPN’ and then install the app. On the app screen of your Fire TV / Stick click the ExpressVPN app. Once the app has connected press the ‘Home‘ button on your remote control. Press ‘Internet‘ (previously known as Silk Browser). You can now locate and watch the BBC Scotland channel. It’s worth noting that the BBC iPlayer Amazon app doesn’t work with the above method or any other method. Once you’re connected to ExpressVPN you need to access BBC iPlayer using the built in ‘Internet’ web browser or install another browser such as FireFox. 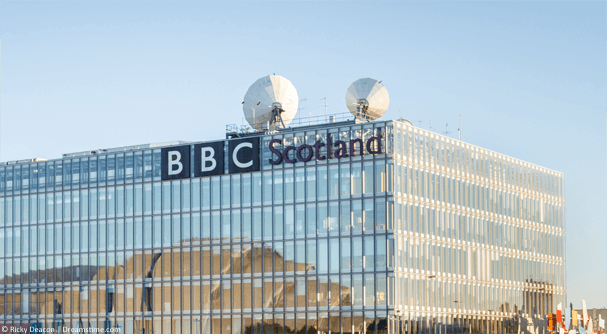 Officially BBC Scotland is only available in Scotland and across the UK. It’s available on services such as FreeView and FreeSat and also online via the BBC iPlayer service. If you’re outside the UK then you’ll need a VPN as explained above which will let you watch BBC Scotland in any country. So you can watch in America, Canada, Australia, South Africa, Spain, Thailand or anywhere else on the planet. BBC Scotland airs between Noon and Midnight. However, the premium hours are between 7 pm and midnight. Before 7 pm the channel will show BBC Two programmes and reruns of BBC Scotland programmes over time. At 9 pm each night a new dedicated Scottish show called ‘The Nine’ will round-up news and other events from across Scotland, the UK and the wider world. Other programmes available include the likes of Still Game, Nae Pasaran, Getting Hitched Asan Style, Sink or Skim and Addicted To… plus much more. To watch BBC Scotland outside the UK you’ll need to get a VPN app from ExpressVPN. A VPN will allow you to watch in any country on any device from computers to laptops, tablets, phones and even on regular TVs using the Amazon Fire TV devices. Follow the dedicated section above for your type of device and enjoy watching BBC Scotland wherever you are in the world. These VPNs do not work with the iPlayer. The BBC block IP addresses which route too much traffic because they know these are VPN’s from abroad. Clearly you’ve never tried any of the recommendations Alastair as they work perfectly and have been tested.